The AVR-1611 is a fine performer and gives its competition plenty to worry about. This five-channel amp tries to bring Denon's legendary sound quality to a low price point without greatly compromising on cutting-edge features. As such, the AVR-1611 boasts 3D compatibility through its four HDMI v1.4 inputs, and chucks in a few other unexpected frills such as Dolby Pro-Logic IIz, which expands the soundstage to include front height channels – as long as you have another amp to run the signal into. What you also get is Denon's impeccable sense of style. The unit's stylish black finish cleverly camouflages the buttons on the fascia, which gives it a clean, uncluttered look and the large display panel provides a lot of information. The rear panel seems sparse at first glance, particularly when compared with the brand's pricier models, but it covers all the basics and, thankfully, the speaker terminals are all binding posts. 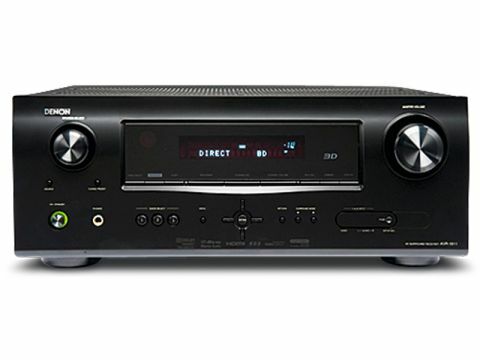 Unlike the Yamaha, the AVR-1611 can decode Dolby TrueHD and DTS-HD MA soundtracks, and offers seven DSP modes to spice up music and movie playback, including a Virtual surround mode. Installation is aided by Audyssey's auto setup mode, as well as a group of technologies (MultEQ, Dynamic EQ and Dynamic Volume) designed to monitor the sound once optimised. Operation is hugely simplified by the onscreen menus, although the graphics are so dated they make Pong look like Call of Duty. Still, at least they're easy to follow and cover all the essential audio and video tweaks. The remote features glow-in-the-dark buttons, most of which are intuitively arranged but the bank of keys at the bottom is a bit cluttered and many of the sound modes get lost in the crowd. The AVR-1611's power rating is quoted at 5x110W, and with movies it's certainly a powerful performer, taking huge dynamic shifts in its stride and handling the explosive carnage at the end of Avatar with neighbour-waking potency. It harnesses that power in a controlled and measured manner, too, and as a result the sound is mostly easy on the ear. That may not suit those who like a bit more bite and aggression to their home cinema sound but it makes for a smooth listen. Crank the volume up too high and a few cracks begin to show – one or two screeching creatures tip the sound into minor harshness – but on the whole, audio is remarkably refined for an entry-level product. It also rains down detail from every speaker, dredging up Pandora's gentle ambience and distant noises, while delivering speech with clarity and authority. All in all, the Denon AVR-1611 is a fine performer that gives its competition plenty to worry about.